Victoria C. Hughey, MBA, is the owner and executive director of Victoria’s School of Dance and Rhythm, LLC. In addition to this position she is also a creative movement/pre-ballet, ballet, tap, and jazz instructor at the school. Native to Pittsburgh, PA, Victoria received a Bachelor’s of Science (BS) in Health Information Management from the University of Pittsburgh, School of Health Related Professions and a Master’s in Business Administration (MBA) from the University of Pittsburgh, Katz Graduate School of Business. 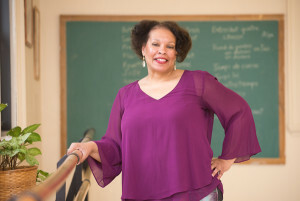 She has taught creative movement, modern, ballet, jazz, and tap for many years to children of all ages and served as choreographer for contestants in the Pittsburgh Miss Black Teenage Pageant. Victoria got the dance bug early as a child, at the age of seven. She has been studying dance for over 45 years in the following specialties: ballet, pointe, modern, jazz, tap, hip hop, and baton twirling. In her youth, Victoria studied modern dance and ballet at the Selma Burke Art Center and the African American Dance Studio in East Liberty. In addition, she was a primary dancer in a community production of “The Wiz.” As a teen Victoria participated in a master’s class given by Otis Salid, original cast member of the Broadway production of “The Wiz.” She also took a master’s class at the Alvin Ailey American Dance Theater in New York City. Additionally, Victoria was number one dancer in the production of “Bye Bye Birdie.” Then as an adult, she studied ballet at the Carnegie Institute of Pittsburgh and Leaps and Bounds in College Park, MD. Victoria then studied ballet and pointe under the direction of Miss Audrey Trojanowski at Graceful Steps Ballet in which she was a soloist in many of the productions. For the last 14 years, Victoria has studied jazz and tap under the direction of Kimberly Curtin at Wilkins School Community Center (WSCC). Over the past seven years, she has studied ballet and pointe under the direction of Dena Holland at Dance Space 304. Currently, Victoria is studying ballet under the instruction of Bernadette Smith at WSCC. Tanya Sheffield graduated from the University of Pittsburgh with degrees in Psychology and Child Development. She is currently working in social services at Mercy Behavioral Health. In 1999 Tanya met Laura Hodge and became a part of Helios Arts and Ampersand Dance Theatre Company, performing in many productions including An Evening with Kurt Weill. From 2007-2011 she continued her collaboration with Laura Hodge at Pittsburgh Dance Arts as a teacher and choreographer. She currently teaches ballet, tap and jazz to students, ages 3 to 93. Tanya looks forward to to a long collaboration with Victoria Hughey and the Victoria’s School and Dance and Rhythm. Francesca Moux is our children’s ballet and tumbling instructor. She has been dancing since she was three years old. Along with dancing, she was a part of her high school cheerleading team. The genres of dance that she has studied include tap, ballet, pointe, jazz, lyrical, hip hop, and contemporary. Francesca competed in many dance competitions with Studio G Dance Center. In 2016, she won the title of Miss Showbiz and was first runner up for overall soloist. Francesca studied under many instructors, including famous dancers such as Comfort Fedoke, Alex Wong, and Audrey Case. She has been teaching at Victoria’s School of Dance and Rhythm for two years and is excited for the future.